With winter now in full swing, I am trying to get seasonal ingredients on the table as much as I can. 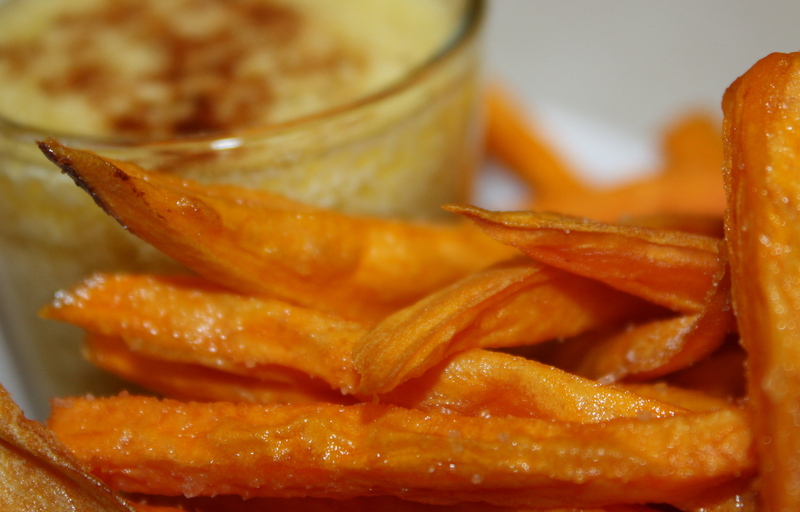 This week I tried out a new experiment with fresh yams I found at the store. This recipe made for a nice sweet and salty treat that the kids just gobbled right up. Enjoy! For the aioli: Whisk the egg yolk with the Dijon mustard. Very slowly, drop by drop, add the canola oil while whisking briskly. The mixture should start to thicken. Once all of the canola oil has been added, then very slowly, add the olive oil. Continue to whisk while adding the olive oil. The key is to add the oils very, very slowly while whisking continuously. (This may take some time to master. If the oil breaks, don’t get frustrated, it happens. You could try again, or like I’ve done many a time, just eat it anyway 🙂 It still tastes pretty yummy, it’s just not the greatest consistency.) Once both oils have been added, mix in the salt, pepper and nutmeg. Pour into a bowl and garnish the aioli with a pinch of nutmeg. 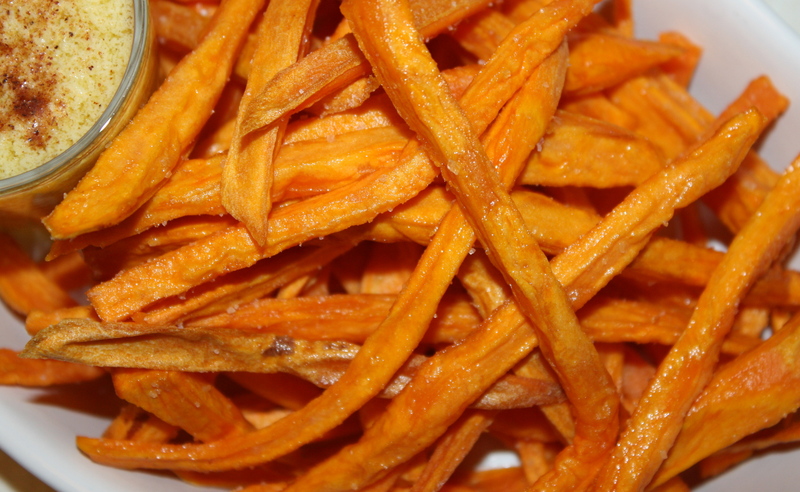 For the yams: Slice your yams into small strips. Pour about one inch of canola oil in a pan and heat it. (A trick is to sprinkle a drop of water in the oil once the oil has been heating for a while. If the water sizzles when you add it, you know the oil is hot enough.) Add a handful of the yams to the hot oil and allow to fry for 3-5 minutes. Remove from the oil and allow to rest on a plate covered with a paper towel to drain off the excess oil. Salt to taste. Serve with the aioli. This entry was posted in Holistic Living, Recipe, Sustainable Living and tagged aioli, aioli dipping sauce, cooking, eco friendly, farmer, farmer's market, food, fresh, fries, garden, gardening, gardens, growing, harvest, holistic, holistic living, home, homemade, homemade fries, homemaker, homemaking, make, making, mama, mindfulness, mom, mother, organic, organic cooking, recipe, sustainable, sustainable living, yam, yam fries, yam recipe, yams. Bookmark the permalink. Looks fabulous….bet they tasted even better!